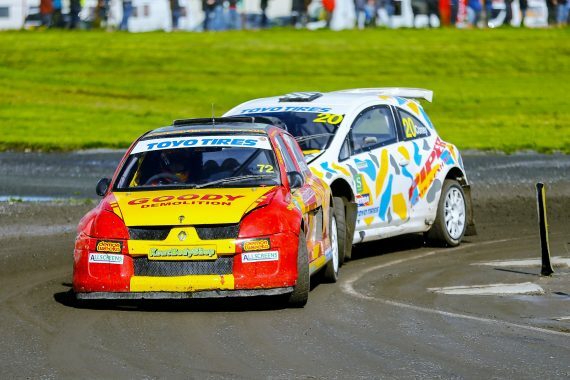 Canterbury based Rallycross driver Tristan Ovenden made the second journey of the year to Pembrey Circuit home of Welsh Motorsport looking to build on his championship lead. However, the day certainly didn’t start out in his favour. The track conditions were not ideal for the Goody Demolition backed driver as the surface was still very wet from overnight rain, making conditions extremely slippery. Especially for the new track layout at turn one. After an uncharacteristic bad start in qualifying 1 due to stalling the car Ovenden left the grid in last place from his second row starting place. He managed to claw his way back up to third place. A better start in qualifying 2 but again the tricky conditions hampered his progress up the field, instead he finished in third place for the second time. After the lunch break the track had dried out considerably which suited Ovenden better and he was able to put this change of track conditions to good effect and recorded the fastest time for Q3. This was enough to secure him the pole position for the final. After a great start and a timely taken joker on the penultimate lap he took the checkered flag with ease notching up yet another 30 championship points. Ovenden now heads into the final round at Silverstone knowing a careful performance will see him retain his Supernational crown for a further year. With two drop scores to be taken into account in this year’s championship Ovenden is 26 and 29 points over his two closest rivals. This entry was posted	on Tuesday, September 25th, 2018 at 9:00 am	and is filed under Motor Racing. You can follow any responses to this entry through the RSS 2.0 feed. Both comments and pings are currently closed.